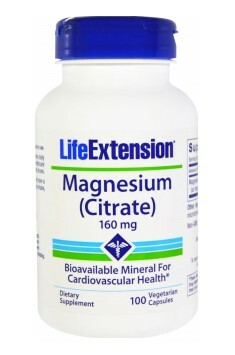 Magnesium Citrate 160mg 100 caps. One capsule 2-3 times a day, after a meal. The recommended daily dose is 200-400 mg (2-3 capsules per day). Best to take the preparation during or shortly after a meal. The use of the supplement in too high dosees can have a laxative effect. In this case the dose should be reduced. Advanced formula supporting liver functions. Restores the proper hepatic parameters. Advanced formula that allows to lower blood pressure. Promotes cardiovascular health. Composition of superior-quality extracts from three types of ginseng. Supports maintaining proper physical functioning. Supplement containing glucosamine sulfate and vitamin C and E. It reduces joint pain and supports regeneration. Alpha-lipoic acid in capsules. It supports work of the heart, works antioxidant and anti-catabolic.